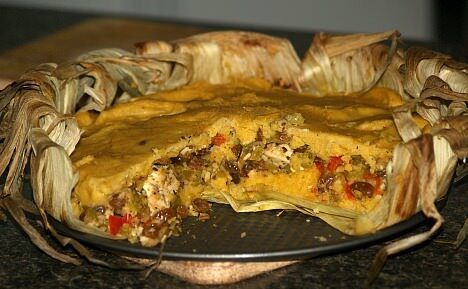 When you learn how to make a tamale casserole recipe, you will find it is a dish stemming from the traditional tamale recipe of Mexico or other of the Central and South American countries. It is easier to make because it can be assembled and placed in the oven to cook. There are many versions but these casseroles are all baked in the oven. In most countries, they are wrapped in dough and then wrapped in some type of leaf like banana; then they are steamed or boiled. 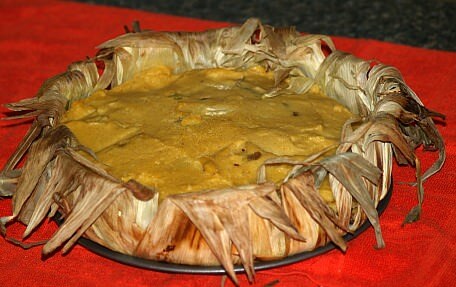 When making tamales, you can substitute dried corn husks or even foil for wrapping the tamales. 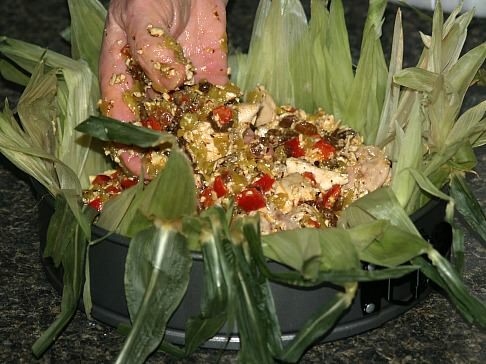 I learned how to make some of the tamale casserole recipes which are actually prepared like the tamales wrapped in corn husks before placing in a baking dish. Then there are simple recipes with the dough simply dropped on top of the meat mixture in a baking dish or some will line the baking dish with a cornmeal mush. However it is prepared, the combination of other ingredients almost always insures it to be very tasty. The ingredients for tamales can be purchased at a Mexican supply market; many can be found in your grocery Mexican section. NOTE: I save corn husks during summer’s corn season to use in these casseroles. 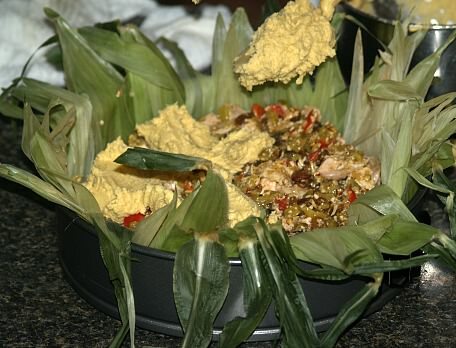 The husks add to the flavor as well as presentation such as in recipe 1. 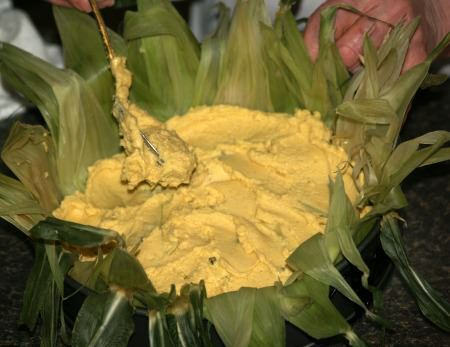 I simple remove the husks from the corn and remove the corn silk. I then place the husks in a plastic freezer bag and place in the freezer. When I am ready to make a casserole, I take them out of the freezer and place in a large bowl or container. Run hot water over the husks and let stand about 2 hours. Drain the husks and place on a tray lined with a clean dish towel. Cover the top with another clean towel and press down to remove excess water. FIRST place 1 ½ cups toasted almonds in food processor; chop very fine. Measure almonds out for sauce and for the filling; set aside. NEXT grease a 10 inch spring form pan. 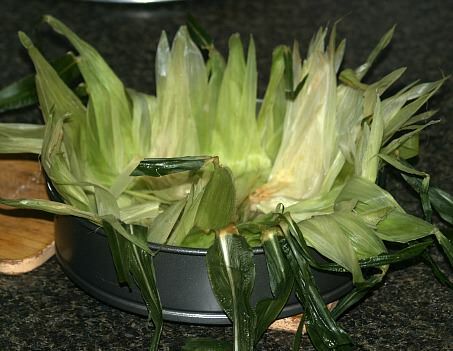 Line the pan with the corn husks extending pointed ends over the sides of the pan; press husks fitting the pan. TO MAKE SAUCE sauté chopped onion and garlic in large skillet with olive; stir and cook until tender. Add tomato sauce, water, paprika, pepper flakes, cayenne, salt and pepper. Bring mixture to a boil stirring constantly; set aside off the heat. TO MAKE FILLING combine and mix turkey or chicken, 1 cup almonds, raisins, chilies, bell pepper and ½ cup of sauce. TO MAKE DOUGH combine and beat all ingredients on low speed until well blended. 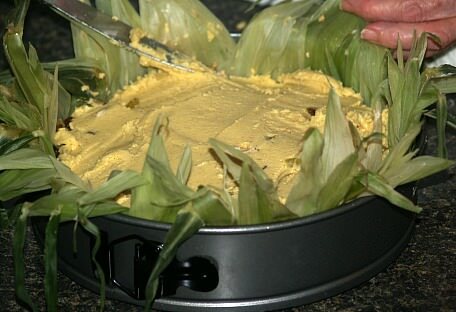 TO ASSEMBLE CASSEROLE spread half of the dough over the corn husks in prepared pan. Spread the filling over the dough; top with remaining half of dough. 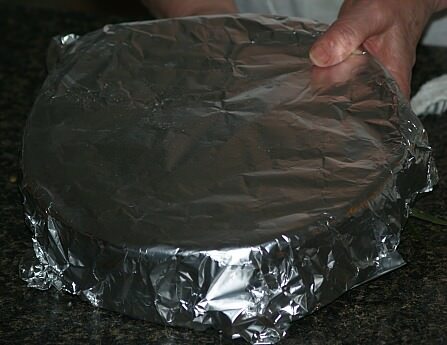 Remove foil and bake about 5 to 10 minutes longer; set on rack to cool about 10 minutes. Remove sides of pan; cut in wedges or spoon out. TO SERVE top with sauce and sour cream. NOTE: This is very filling! I cut in small wedges and offer seconds. Combine and mix together all the dry ingredients. Add eggs and enough milk to make the consistency of cake batter. Pour batter into a preheated iron skillet or pan with a little hot oil in the bottom. Bake about 30 minutes or until set and golden brown. Brown hamburger and onion; drain. Add salt, pepper, garlic and onion salt to taste; add green chilies. Cut tamales lengthwise; line bottom of 9 X 13 inch greased baking pan. Pour hamburger mixture over tamales; spoon chili con carne over mixture. Put olives and cheese on top; bake at 375F degrees for 30 minutes. Add lettuce and tomatoes on top; serve with salsa and sour cream. 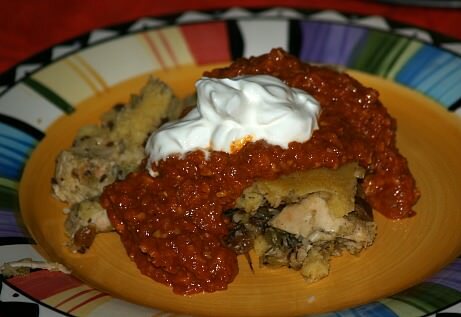 Learn how to make this tamale casserole recipe with Mozzarella and Cheddar cheese. Preheat oven to 425F degrees; lightly grease a 9X13 inch baking pan. Brown ground beef, onion and green pepper stirring until beef is crumbly. Drain drippings from mixture; return mixture to skillet. Add tomatoes and seasoning mix to skillet. Over medium heat bring to a boil, cover and simmer 15 minutes stirring occasionally. Stir cheeses and olives into skillet mixture; spoon mixture into prepared pan. Prepare cornmeal mix according to package directions; spoon in 1 inch wide strips diagonally across meat mixture. Bake for 15 minutes until cornmeal is golden brown; serves 6 to 8. OPTION: Serve with salsa and sour cream.